Small doses of X-ray radiation are used to create images in scanners using backscatter technology. (CNN) -- They're arriving at airports across the country. Some complain they are invasive and an assault on our privacy. 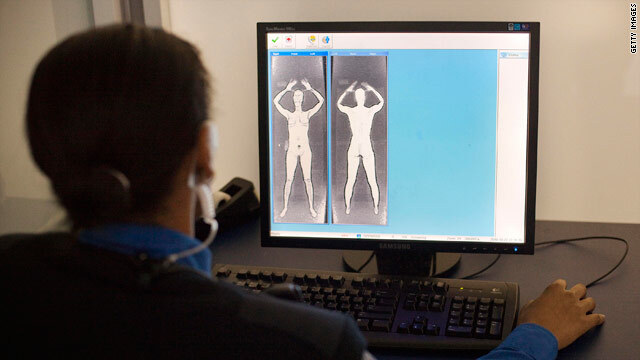 But are body scanners at security checkpoints dangerous? The Transportation Security Administration's advanced imaging technology machines use two separate means of creating images of passengers -- backscatter X-ray technology and millimeter-wave technology. At the end of October, 189 backscatter units and 152 millimeter-wave machines were in use in more than 65 airports. The total number of imaging machines is expected to near 1,000 by the end of 2011, according to the TSA. While the TSA says the machines are safe, backscatter technology raises concerns among some because it uses small doses of ionizing radiation. The use of millimeter-wave technology hasn't received the same attention, and radiation experts say it poses no known health risks. The risk of harmful radiation exposure from backscatter scans is very small, according to David Brenner, director of the Center for Radiological Research at Columbia University and a professor of radiation biophysics. But he said he is concerned about how widely the scanners will be used. "If you think of the entire population of, shall we say a billion people per year going through these scanners, it's very likely that some number of those will develop cancer from the radiation from these scanners," Brenner said. Skin cancer would likely be the primary concern, he said. Each time the same person receives a backscatter scan, the small risk associated with the low dose of radiation is multiplied by the number of exposures. Brenner said the risk to an individual is "very small indeed" for a single scan. He said he is most concerned about frequent fliers, pilots and young people, because children are more sensitive to radiation. Backscatter technology is safe, the TSA says, and enables the detection of nonmetallic threats, including weapons and explosives. It has been evaluated by the Food and Drug Administration's Center for Devices and Radiological Health, the National Institute of Standards and Technology and the Johns Hopkins University Applied Physics Laboratory, according to the agency. "TSA sets strict standards for all of its technology to include detection capabilities, operational capabilities and health and safety standards. The two approved technologies that meet all of those standards are backscatter and millimeter wave," the agency said in a statement. Full-body scanning is optional for all passengers passing through U.S. airports. Those who opt out of the screening technique will receive additional screening, including an enhanced pat-down procedure. Two pilots unions, representing some 16,000 pilots, have urged their members to avoid full-body scanning, citing health concerns as a key reason. Anyone who flies is exposed to increased cosmic radiation due to high altitudes, and many pilots experience this exposure almost daily. The TSA says each backscatter scan emits radiation equivalent to just two minutes of cosmic radiation at altitude. Peter Rez, a professor of physics at Arizona State University, disagrees. Rez has independently calculated the radiation doses of backscatter scanners using the images produced by the machines. "I came to the conclusion that although low, the dose was higher than they said," he said. Based on his analysis, Rez estimates each scan produces radiation equivalent to 10 to 20 minutes of flight. In April, four science and medical faculty members at the University of California, San Francisco, sent a letter to the director of the White House Office of Science and Technology Policy expressing concerns about potentially serious health risks related to the X-ray scanners. In the letter they claimed there could be risks to various population segments, including children, senior citizens and women susceptible to breast cancer. The group also called for a clear screening policy for pregnant women once possible risks to the fetus are known. The group wants a review of existing data and recommendations for additional study by an independent panel of scientific experts. Last month, the Department of Health and Human Services provided a point-by-point response to their concerns, asserting that the potential health risks from full-body X-ray screening are "minuscule." The letter cites expert analysis, reports and recommendations spanning two decades. "As a result of those evidence-based, responsible actions, we are confident that full-body X-ray security products and practices do not pose a significant risk to the public health." Dr. Marc Shuman, a cancer expert and one of the concerned California professors, said the four are in the process of writing a detailed response to the Department of Health and Human Services but called the agency's arguments "seriously flawed." Shuman said they believe there should be a moratorium on full-body scanning until further study is conducted. The American College of Radiology, an organization of more than 34,000 professionals, including radiologists, oncologists and medical physicists, said it believes backscatter technology is safe. "The ACR is not aware of any evidence that either of the scanning technologies that the TSA is considering would present significant biological effects for passengers screened," the organization said in a statement. The organization referenced a report from the National Council on Radiation Protection and Measurements, citing that a traveler would need to receive 100 doses of backscatter radiation per year to reach what it calls a "Negligible Individual Dose." "By these measurements, a traveler would require more than 1,000 such scans in a year to reach the effective dose equal to one standard chest X-ray," the group's statement said. Rez estimates 50 to 100 doses of backscatter radiation would be equivalent to a chest X-ray. But he said the dose is not his main concern with backscatter machines. "The thing that worries me the most, is not what happens if the machine works as advertised, but what happens if it doesn't," Rez said. A potential malfunction could increase the radiation dose, he said. But there's really no case to be made for deploying any kind of body-scanning machine, Rez said. "They're both incredibly unlikely events. These are still a factor of 10 lower than the probability of dying in any one year from being struck by lightning in the United States."